The Oklahoma City Thunder are exploring options as they look to move on from Carmelo Anthony, and the Brooklyn Nets could be a potential trade partner. Mitch Lawrence of Sporting News reported Wednesday that one possible deal would send Anthony and draft picks to Brooklyn while bringing Jeremy Lin to OKC. The Nets would then buy out Anthony, per Lawrence. 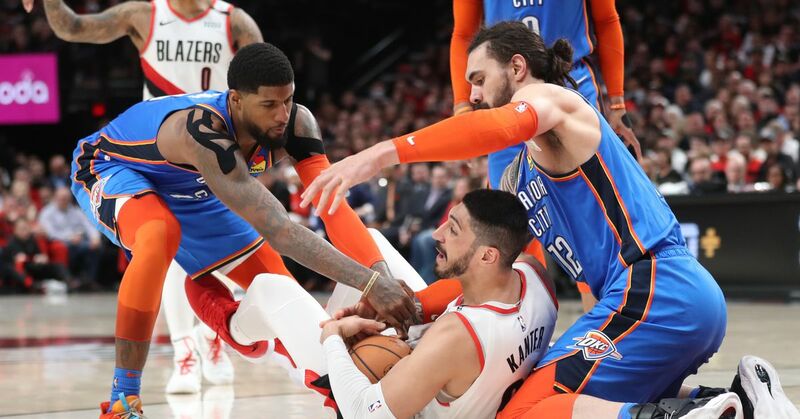 ESPN.com's Adrian Wojnarowski reported last week that the Thunder were looking to move on from Anthony this summer, as it could save the team more than $100 million. Both a trade and a buyout are reportedly on the table. Between Anthony's $27.9 million salary and his no-trade clause, dealing him could be complicated. However, he could be incentivized to approve a trade if the receiving team agreed to waive him, allowing him to become a free agent. The 34-year-old forward averaged career lows in minutes (32.1), field-goal percentage (40.4) and scoring (16.2 points) in his first season in Oklahoma City. Lin, meanwhile, has exercised his $12.5 million option for the 2018-19 season. He is coming off a campaign in which he ruptured his right patella tendon on opening night and missed the rest of the season. The 29-year-old averaged 14.5 points on 43.8 percent shooting, including a career-high 37.2 percent from beyond the arc, in his first year in Brooklyn in 2016-17. He has played for six teams in his eight-year NBA career. Anthony and Lin were teammates with the New York Knicks in 2011-12. That's when "Linsanity" burst onto the scene, and Anthony ultimately played a role in Lin's exit from the Big Apple. The two veterans once again find themselves linked.